German Shepherd Temperament: What's It Generally Like? A German Shepherd temperament is his behavioral approach toward life. It determines how he perceives and reacts to his environment and the individuals within it. German Shepherds, as a breed, are generally easygoing, readily adapting to new situations and humans without nervousness. It should be noted that this description is accurate for the breed as a whole. Within any breed, there will be individual dogs who do not conform to the breed standards for either conformation or temperament. Given the vast numbers of German Shepherds, the breed undoubtedly contains individuals who display a broad spectrum of temperamental characteristics, ranging from truly stellar to downright dangerous. How Do I Know What A Specific German Shepherd Temperament Is Like? Regardless of whether you’re interested in a puppy or an adult German Shepherd, picking one with a good temperament is easier if you know a little about basic canine behavior and if you’re a good observer. Responsible breeders can also advise you about the temperaments of their dogs and puppies. When choosing a puppy, look for one who eagerly joins in the games and antics of his sisters/brothers. Pass up the puppy who bullies everyone else in the litter. And you also shouldn’t go for the shy, nervous German Shepherd puppy who sits in the corner watching everyone else. A puppy with a good temperament, when examined, will accept your handling without excessive fear or undue protest (wiggling is permitted). Reject any puppy who shows any signs of aggression, such as growling or nipping. It’s sometimes a little easier to judge the temperament of an adult German Shepherd, especially if you can talk with the previous owner. Good questions to ask would be ones specifically addressing the German Shepherd’s basic attitude, tractability, willingness to accept the owner’s authority, lack of aggressive behavior and demeanor with children. You should also ask about the German Shepherd’s activity level – does he go-go-go all day long or is he a couch potato? You’ll also want to do a little examination and observation on your own. The adult dog with a good temperament will greet you happily, without any signs of shyness or aggression. He should be attentive and responsive. Once you’ve gotten acquainted, he should stand or sit quietly while you examine him all over, including mouth, ears, paws and tail. If he won’t allow you to check him over, or seems nervous or irritable about it, you’ll probably want to pass him up. German Shepherd Temperament: How Compatible Are They? German Shepherds have a number of behavioral characteristics that make them great pets. As a general rule, they are friendly, easygoing and affectionate. Their instinctive desire for human companionship leads them to form strong bonds with their human families. Because of this desire and their working-dog background, most German Shepherds graciously accept their position within the family pack and seldom challenge authority. Some characteristics may detract from the German Shepherds’s suitability as a pet, at least for some people. German Shepherds are active, energetic dogs who require plenty of vigorous exercise each day. If denied exercise, they may become escape artists or engage in destructive behaviors, such as digging or chewing. Their love of exercise may lead them to roam should they get out of their yard or enclosure. German Shepherds can also be stubborn. Because of this, training requires patience and persistence. Fortunately, the German Shepherd’s stubbornness is tempered by his otherwise great personality – he’s certainly not dumb, just a little hardheaded. German Shepherds, are in my opinion, one of the best family watch dogs due to their natural instincts to listen, learn and obey. They can both be threatening – but can are also very loving with his family – and will respond to a command on a moments notice. How Are German Shepherd With Children? As a rule, German Shepherds make good companions for children. They’re usually amicable, mild-tempered and gentle. As adults, German Shepherds are large enough that children can’t hurt them easily. In addition, their playfulness, and their love of exercise and the outdoors make them well suited for people with active kids. German Shepherds may not be the best choice if the child is very young, small or somewhat timid, because the dog’s active nature and size may be frightening. Selecting a smaller German Shepherd who has a calmer personality might be an acceptable solution. It’s often best to wait until your child is a little older (and larger) before you bring a German Shepherd into the home. What Can I Do To Ensure That My German Shepherd And My Children Get Along? Always be gentle with your German Shepherd, and particularly with a puppy. Respect the German Shepherd’s personal space and possessions, especially where food is concerned. Never try to force the German Shepherd to play with you. Let the German Shepherd get away from you if he wants. No rough play, such as wrestling or tug-of-war. Never encourage the German Shepherd to attack someone, even in play. Never scream at or around a German Shepherd. Teach your children to keep their voices down and to be calm around your German Shepherd. Boisterous, rowdy children seem to intimidate some German Shepherds, particularly German Shepherd who are lacking confidence. In such cases, the German Shepherd usually tries to escape – if only to a quieter place in the yard or house. Not every German Shepherd flees a pack of rowdy kids, however. Can I Leave My German Shepherd Alone With My Children? Even if your German Shepherd is normally quiet and friendly, you should always supervise him while he’s around young children – for his protection as well as theirs. A dog who regularly exhibits dominant behavior should not be left unsupervised with children of any age. A dog who has ever aggressively bitten anyone should not be around children at all. Even if nipping occurred only during play, you should closely supervise your German Shepherd around children until you’re absolutely certain the behavior won’t be repeated. Are German Shepherds Compatible With The Elderly? 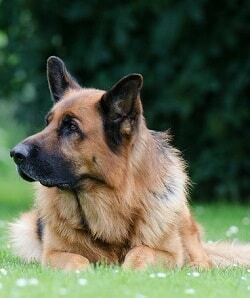 Most German Shepherds are gentle and friendly with the elderly. Of course, you must take care with a rambunctious or poorly trained German Shepherd, especially if the elderly person is frail. German Shepherds who tend to jump up are not a good choice. A well-trained older German Shepherd is usually more sedate than a younger dog and therefore better suited as a companion for an elderly person. The close relationship that is likely to form from this arrangement is beneficial to both parties. If an elderly owner cannot personally attend to the German Shepherd’s need for a lot of exercise, he or she may be able to hire someone to help out. What Are German Shepherds Like Around Non-Family Members? Your German Shepherd will probably follow your example with regard to non-family members in the home. For instance, if you warmly greet your visitor, your German Shepherd probably will too. If you’re not particularly happy to see the visitor,your German Shepherd may be more standoffish. Your German Shepherd may be shy around non-family members at home, but you can encourage him to relax by being overly upbeat and happy whenever you have guests. The same technique can be used to help your German Shepherd be less nervous with unfamiliar people and situations outside the home. How Is My German Shepherd Likely To Behave Around Other Dogs? Dogs of different ages, such as puppies and adults, usually tolerate one another better than they would if they were similar ages. The exception to this is when two puppies meet. These youngsters generally form quick friendships, possibly because of their natural submissiveness and lack of social experience. Usually, males and females also get along better than two males or two females, but this varies widely depending on the circumstances. For example, a female with a litter of young puppies maybe aggressive toward any dog, regardless of gender.After learning a bit about canine social order, it shouldn’t surprise you to learn that the meeting of two dogs who are strangers can be just about as complicated as a meeting between high-level diplomats. Your German shepherd may consider an unfamiliar dog to be an ally or an adversary, depending on the other dog’s age and gender and where the meeting takes place. How the dogs get along may even depend on whether or not either owner is present. Where meetings take place is important. Many dogs (females as well as males) will fiercely guard their own territory their house and surrounding property – so dogs who are strangers will usually get along better if they meet on territory that neither dog considers his own. Finding neutral territory can be tricky. For example, you might think that the neighborhood park is a great meeting place, but if you and your German Shepherd have spent a lot of time there, she may consider it part of his turf. If this is the case, when he meets a dog with whom he’s not acquainted, he’ll probably treat him like an intruder, just as he would if someone stepped into your backyard. Finally, some dogs just seem to hit it off better when their owners aren’t around. Why this happens is a bit of a mystery, but it could stem from diminished feelings of jealousy or protectiveness. It could also be that the owners, in an attempt to smooth things out, actually disrupt the normal dog-to-dog interaction. How Does My German Shepherd Behave Around Pets (Other Than Dogs)? In general, your German Shepherd’s behavior with pets other than dogs will depend on his personality and several factors related to the other pet, such as what kind of animal it is, and how it acts around your German Shepherd. The most common other pet is a cat. Contrary to traditional beliefs and vintage cartoons, many dogs and cats get along quite well with each other, particularly if they were raised together. Sometimes it’s not the pet itself, but the pet’s behavior that evokes a response from a dog. For example, your German Shepherd may treat the family cat or rabbit gently as long as it sits quietly but eagerly chase it if it runs away. There are some pets that your German Shepherd is likely to take a little too much interest in: birds, especially free-ranging ones such as chickens, ducks or geese. Given his hunting instincts, he may just decide that those birds are perfect candidates for retrieving practice! When you introduce your German Shepherd to other pets, you should constantly supervise them, at least at first. This is especially important if one of the animals is much larger than the other or capable of causing serious injuries. Keep in mind that your supervision may be required to protect your German Shepherd from another pet. For example, an adult cat might really hurt a puppy who gets a little too nosy. That’s it! I hope you got a lot smarter on a German Shepherd temperament. Throw me a comment if you have any follow up questions. I love German Shepherds and really appreciate you going into so much detail on their temperament. Shepherds are very energetic, but they do take training really well. At least that is my experience. When it comes to kids, I think it is good to have a bigger dog. Like you said, it is harder for the kids to hurt the dog and trust me, your kids will fall on your dog a couple of times. I couldn’t agree more! 🙂 Thanks for the kind words.